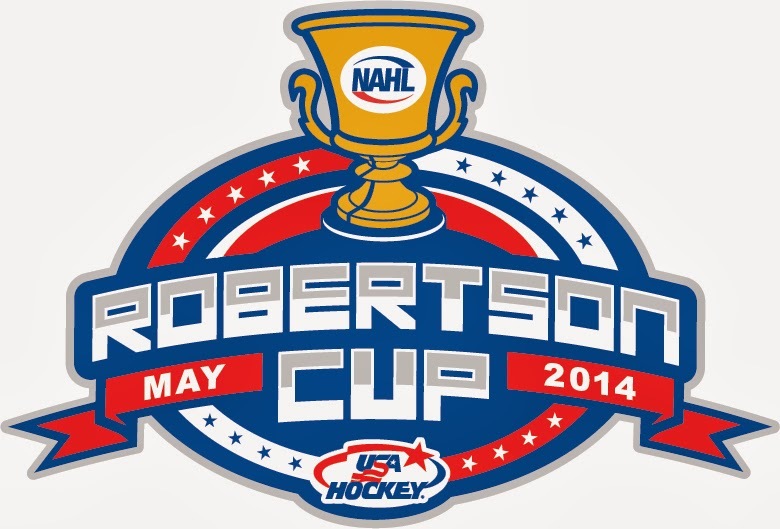 The NAHL 2013-2014 regular season has come to an end. Luckily for the Tomahawks the year is not over yet, as they qualified for the 2014 NAHL playoffs. It wasn't by winning a game this weekend, as they dropped their last two games of the season vs. the Janesville Jets, 5-3 and 4-1. 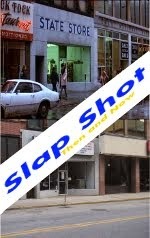 The Soo Eagles who were swept by the Tomahawks the weekend before (and gave the Tomahawks the points they needed in the standings) beat Springfield Jr. Blues on Friday night, knocking the Jr. Blues out of the playoffs and gave Johnstown their second playoff birth in their short two season history. Brett Young played in both games for the Tomahawks as Alex Okicki is still out with a lower body injury. Hopefully, Okicki will be ready to go for the first round of the playoffs, which starts this Thursday in Port Huron. Though the scores did not go in Johnstown's favor they, for the most part, played two good games. Both games this past weekend saw the Tomahawks even with Janesville until the dying moments. This of course is something the 'Hawks have to work on for the playoffs. Johnstown finished the season 2-10 in their last twelve games. Now it's a "new" season and a perfect time to put together a nice long winning streak. On Wednesday, we'll have the Playoff Preview between the Tomahawks' and the Fighting Falcons. We'll take a look at the matchups between the two teams this season, and we'll take a look back at last year's playoff series between the two teams. ---Shane Bednard is the new top scorer for the Johnstown Tomahawks in the regular season posting 51 points (19 goals, 32 assists). Last year Cody Gylling lead the Tomahawks with 45 points (16 goals, 29 assists). ---Alex Okicki set a new single-season wins record, posting 21 wins. Last season, Johnstown's top goalie Chris Truehl posted a team leading 17 wins. ----Last season the Tomahawks' finished the season with a record of 27-21-12 66 points. This year the Tomahawks finished 28-27-5 61 points. We are working hard putting together our Media Kit for possible business looking to advertise on our blog. If all goes well, we should have that information up on our page within the next week or so, under the Advertise tab. We will be offering a wide range of advertising choices on our blog, and through our Twitter and Facebook social media accounts. Also, we'll have some fun "Free" opportunities with TheTomablog. Only one game remains in the NAHL regular season and it took all but one game to decide which four teams will make the playoffs in the North Division. Currently the dates for round one have not been posted by the NAHL, but the first round, which is a best-of-five series can not start before April 3rd and must conclude by April 14th. It's up to the teams to schedule the games, so that's exactly want each front office is working on now. The higher seed has the right to host three games, the lower seed two, only if the series goes the full five games. Port Huron is the number one seed in the North Division, and they'll take on our Tomahawks. Currently Michigan sits in second place, but if Michigan loses their game tonight in regulation and Janesville wins in regulation, Janesville will take second place spot. Either way, Janesville and Michigan will play each other; the only thing that needs to be determined is who has home-ice advantage. Last season Johnstown faced Port Huron in a best-of-three series, which Port Huron won, in three games. Now the two teams are set to faceoff yet again, and this time Johnstown will be looking for revenge. During the regular season, the two teams played some very rough-entertaining hockey games. Johnstown was 6-5-1 this season vs. the Fighting Falcons. Last season neither Janesville or Michigan made the playoffs. They were the only two teams in the North Division not to qualify for the post season. Michigan has been a member of the NAHL now for four seasons. In 2010-2011, they made it the whole way to the finals, only to lose in the Robertson Cup Tournament. division finals, the teams will be reseeded, and the top team will host the bottom team in a best-of-three round. The same will happen in the finals. The best team of the remaining two teams will host all games in the best-of-three. So if Johnstown can play great hockey, they'd have a chance to win the championship at home. In 2011-2012, Michigan made the playoffs for the second straight year, this time losing in the first round. Janesville has been a member of the NAHL now for five seasons. In their first three years in the league, they made the playoffs, only to lose in the first round each time. Johnstown's opponent the Port Huron Fighting Falcons have been members of the NAHL for now four season. In 2011-2012, they made it the whole way to the finals but came up just short. Last season, after knocking the Tomahawks out of the playoffs, Port Huron was swept by the Soo Eagles in the second round of the playoffs. The playoff schedule should be release either tomorrow or Monday. When that information is released we'll pass it along, with ticket information. The Janesville Jets clinched a playoff spot last night beating the Springfield Jr. Blues, 2-1 in regulation. This is good news for the Johnstown Tomahawks, as the 'Hawks are now one point away from making the playoffs for the second time in their second season of play. Johnstown faces off against Janesville this weekend and Springfield plays two games vs. the Soo Eagles. Johnstown is in fourth place with 61 points. Springfield sits fifth with 58 points. If Springfield sweeps the Eagles that'll give them four more points for a total of 62. If Johnstown picks up just one point this weekend, it'll tie the Jr. Blues with 62 points, but since Springfield can only reach 27 wins if they sweep their last two games, Johnstown would win the tie breaker having 28 wins this season. If Springfield loses one game or doesn't pick up all four points, Johnstown's in without having to win a game. If Johnstown can pick up one point, or win one of the two games this weekend, they'll make the playoffs, and it won't matter what Springfield does. But if Springfield sweeps the Eagles, and Johnstown gets swept by Janesville without picking up a point, Springfield will be in the playoffs and Johnstown's season will come to an end. If Johnstown does make the playoffs, they'll face the Port Huron Fighting Falcons in the first round of the NAHL playoffs. Unlike last season, the first round is best of five, not best of three as it was last year. Port Huron knocked the Tomahawks' out of the playoffs last season in overtime, winning the series 2-1. Labels: 2014 playoffs, Johnstown Tomahawks, NAHL. When you score 7 points in three games this is an automatic decision. That's just what Mitch Hall did this past weekend vs. the Soo Eagles. Of those 7 points, six of them were assists. You can check out the whole article released by NAHL.com about the first star selection. It also features a quote from head coach, Jason Spence. Another Tomahawks' player received a honorable mention from this league for his performance this past weekend. That player is Brandon Reinholz. In three games this weekend Reinholz scored 5 points (2 goals, and 3 assists). Both players are going to be missed in Johnstown come next season, not only for their great on ice performances but their character off the ice. 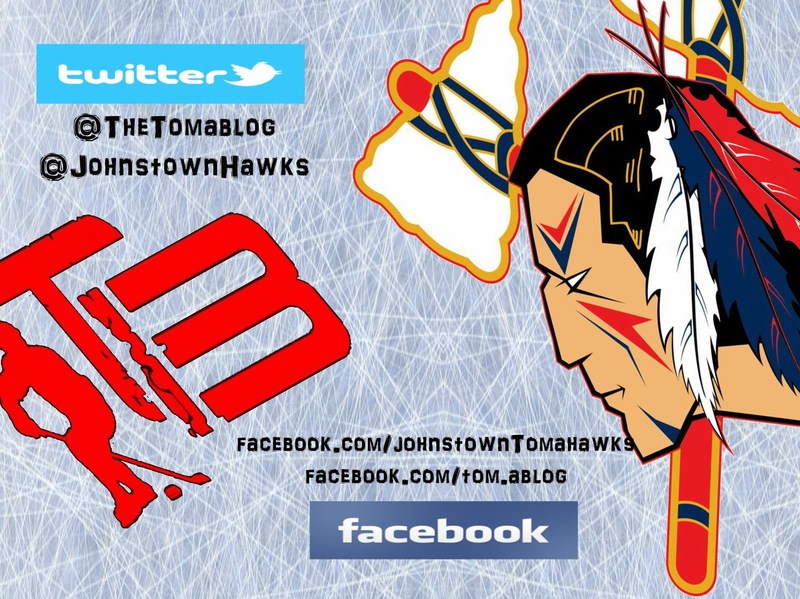 The Johnstown Tomahawks needed a big weekend, and they were able to put together two solid wins to remain in the playoff hunt. All three games this weekend saw the Tomahawks fall behind only to battle back and win two of the three games. On Sunday, after being down 3-0, the 'Hawks tied the game in the third period, and things looked to be headed into overtime. With less than two minutes left though, Soo regained the lead and ultimately came away with two points. The first team in the North Division was official eliminated from playoff contention. After losing to the Tomahawks on Saturday night, Soo's playoff hopes ended. One week left in the NAHL regular season, and three teams (Johnstown, Janesville, and Springfield) will all be battling for the last two playoff spots. We'll take a look at the scenarios in a few minutes but before we do, let's look back at the three games this weekend. On Friday night, the Tomahawks went into the third period down 3-2. During their seven game losing streak, the Tomahawks didn't score more than two goals in a game and now found themselves having to find a way to score..
Luckily Johnstown's scoring finally came to life as they scored four straight third period goals to win the game 6-3. ---Okicki picked up the win making 23 saves on 26 shots. ---Tomahawks got goals from, Recktenwald, Watt, Hall, Linkenheld, Reinholz, and Cuckovich. 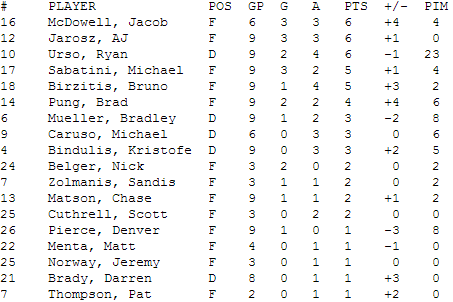 ---Mitch Hall also had three assists in the game for a season high four point night. ---Johnstown went 5 for 5 on the power play. On Saturday night things were tied 2-2 towards the end of the third period, when Johnstown took the lead at 16:46 from a goal scored by Matt Meier. It looked like the Tomahawks were going to pull off a win only to see the Eagles tied the game back up at 17:44. The game went into overtime and then into the shootout. Johnstown's first shooter, Tyler Basham was able to beat Soo's netminder Paige Skoog. Alex Okicki shut the door until the fourth round when Matt Menta was able to beat Okicki and tied the shootout at one. Mitch Hall then regained the lead with a beautiful move. Okicki made the last save in the shootout and gave Johnstown the shootout win. The loss knocked the Eagles out of playoff contention. In a twist of bad luck, Okicki got hurt making the last save in the shootout and had to be carried off the ice. As of right now he's day-to-day. Johnstown got regulation goals from Tyler Basham and Jordan Watt. Mitch Hall had two assists in the game. Okicki made 38 saves on 40 shots, picking up his 21st win of the season, a career high for Alex. The 21 wins is also a Tomahawks record for most wins in one season by a goaltender. The win was Johnstown's 28th of the season. Last year Johnstown finished with a total of 27 wins. On Sunday with Okicki barely able to skate due to his injury, Brett Young made his fifth start. Johnstown and Soo played a scoreless first period. In the second, Soo came out on fire and scored three straight goals. After Johnstown called a timeout to regroup, the Tomahawks got back to their game, netting the next three. Reinholz, Recktendwald, and Meier all scored for the Tomahawks. Things seemed to be headed into overtime, but Soo scored the game winning goal with only a minute-thirteen left to play. Young made 35 saves on 39 shots in the loss. Young is still looking for his first win of the season. Johnstown was 2 for 6 on the power play. Mitch Hall had an assist in the game as Dakota Menslage had two assists. Johnstown now has an overall record of 28-25-5 good for 61 points. That currently points them in fourth place, one point behind Janesville for a third place tie. Mitch Hall had seven points this weekend. If he isn't named the North Division star of the week, we'll be shocked. 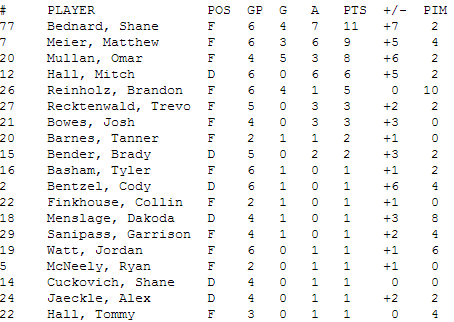 Hall is third in the NAHL in defensemen scoring. How he doesn't have a college commitment yet has us scratching our heads. This upcoming weekend Johnstown heads to Janesville for the last two games off the regular NAHL season. Before Janesville takes on Johnstown, they'll play one game on Tuesday vs. the Springfield Jr. Blues. So how can Johnstown clinch a playoff spot? If Janesville can beat Springfield in regulation, then Johnstown only has to get two points to clinch a playoff birth. Springfield then plays their last two games vs. Soo. If Springfield wins on Tuesday and get's two points, that'll give them 60 points. One point behind Johnstown. If Springfield sweeps Soo, Johnstown must get three out of four points vs Janesville. Basically we'll have a clearer picture of what needs to happen after Tuesday night's game. We'll make another post on the blog after that game to break down the playoff scenarios better. Easiest way to do things is for Johnstown to get all four points vs Janesville and then they won't have to worry about what Springfield does. The anticipation is going to kill us. If you follow us on Twitter or Facebook you'll have seen our attendance numbers. Compared to last year, the attendance is down, but only slightly. If you think about it. No HUGE promotions, there was NHL this season, and a heavy schedule of home games at the beginning of the year, the attendance numbers look pretty good, at least to us they do. We didn't factor in the NAHL's showcase numbers into the attendance. Two of those games were considered "home games". 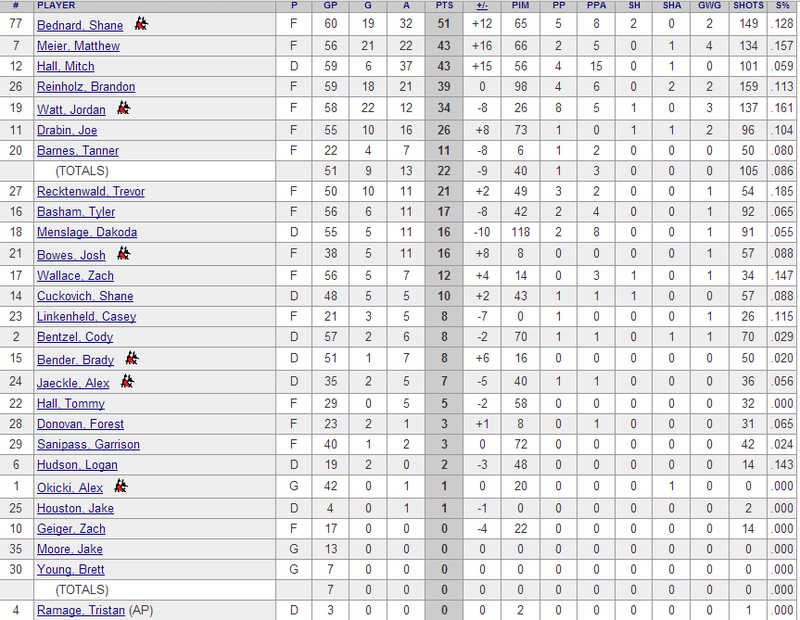 If we did, this years final numbers from NAHL.com give Johnstown an average of 2,514. Last year we had an average of 2,527. It's finally here. The last homestand of the season. It feels like just yesterday the season started, and we're already about to end the second full season of hockey back in Johnstown. Instead of the typical two game weekend, this will be a three game weekend which will give everyone a chance to catch at least one last game. The Soo Eagles come to Johnstown as the last place team in the North Division but are still in the playoff hunt. This could be a make or break weekend for the Tomahawks in regards to their playoff chances. Other than the 9-4 loss to the Warriors a few weeks ago, the Tomahawks have held the opponent to two goals per game (one 3 goal game came in a shootout). If the Tomahawks can continue to play well in their own zone, and find a way to start scoring goals, there's no reason the team can't end the regular season strong, and maybe on a winning streak. Johnstown and Soo play each other three times, and then Johnstown wraps up the season in Janesville with two games vs. the Jets next weekend. 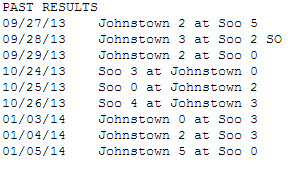 Johnstown and Soo have played against each other a total of nine times this season. In those nine games, Johnstown is 4-5. Should be an exciting weekend of hockey with a lot of playoff implications. Don't forget it's also Fan Appreciation Weekend so Johnstown should have three big crowds and the War Memorial will be rocking. Since this is the last homestand of the season, this is also your last chance to see seven Tomahawks' players who are in their last year of junior hockey. When the Kalamazoo Jr. K-Wings folded last season we said on this blog that Okicki is a player we'd love to pick up. When tryouts started for the team, there was Okicki's name on the roster, and we couldn't have been more excited. Okicki has played great for Johnstown, and if the team could have scored a few more goals these past few games, he'd have well over 20 wins this season with the team. Currently, Okicki is 19-5-1-2 with 4 shutouts. He also has a GAA of 2.53 and a save percentage of .919. 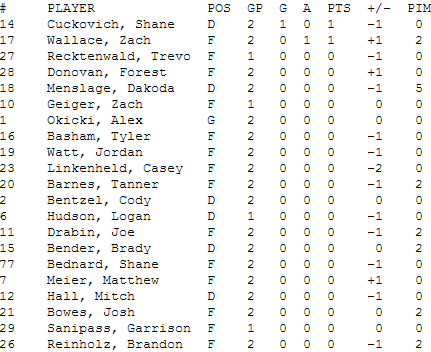 Last season Johnstown's goaltenders combined to post two shutouts, one by Truehl and one by Brennan. Overal Okicki has an NAHL record of 52-35-7-2 with 8 shutouts. His career GAA is 2.62 and save percentage of .919, with five games remaining this season. Okicki is currently the leader in All-Time wins for the Tomahawks as Chris Truehl last season posted 17 with the team. The number one goalie next season is going to have some big shoes, or should we say, skates to fill in net for the Tomahawks. When next season begins, it's going to be weird not seeing Bentzel out on the ice for the Tomahawks. Bentzel has been with the team both years the 'Hawks have been in Johnstown. For being one of the team's biggest players, you don't always notice him on the ice, but as a defenseman that's a good thing. Bentzel has been a solid d-man for the Tomahawks, as well as someone that can help on the offensive side of the puck now and then. Bentzel has also done a great job sticking up for his teammates dropping the gloves when need be. With five games left, Bentzel has played a total of 104 games for the Tomahawks, scoring 3 goals, 10 assists, good for 13 points, 124 penalty minutes and is a -9 (only a minus 1 this season). Last season Hall was brought to the team via a trade with the Jamestown Ironmen. As soon as he got to Johnstown he helped the team on both sides of the puck, scoring 13 points in 22 games. While playing for the Ironmen he only registered 3 points in 22 games. When Johnstown's top offensive-defenseman begun his college career, Casey Nelson, the Tomahawks needed someone to fill his role. Hall has done that, and more. This season he's had a record year scoring 36 points in 54 games. In total he's played 100 NAHL games, scoring 10 goals, 42 assists, good for 52 points, has 76 penalty minutes, and a very healthy plus 25. A great skater, who can play at both ends of the ice, Johnstown will miss his services next season. 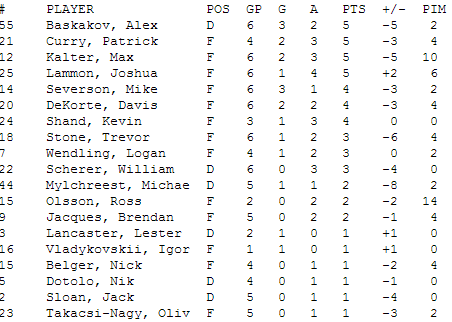 This was the only season Basham played in the NAHL, appearing in 51 games (five remaining) with the Tomahawks. 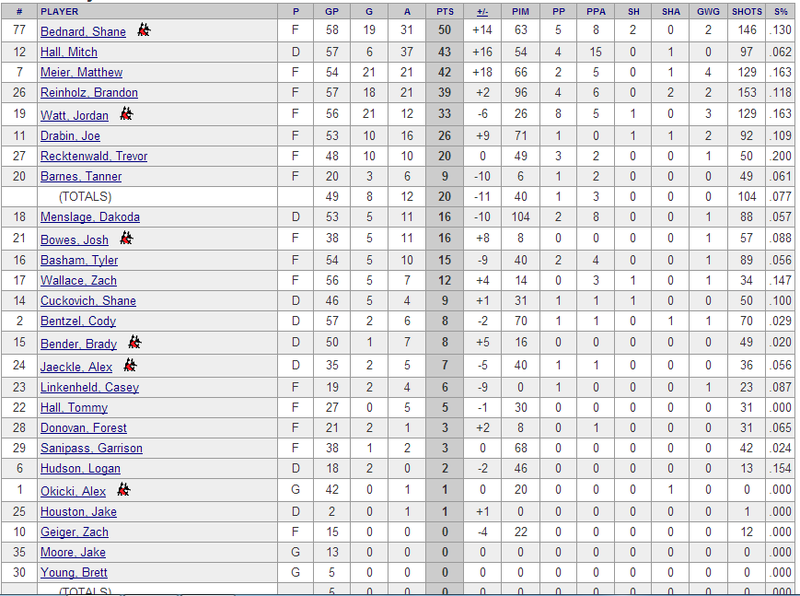 In that time he's scored 4 goals, 8 assists, good for 12 points, 30 penalty minutes, and is currently a minus 5. Basham is one of Johnstown's import players from Canada. This season Basham has been most deadly in the shutout were he is 3 for 5. Wallace is another player that's played two seasons with the Tomahawks, but he started last season playing for Fresno before he was traded to Johnstown at the beginning of the season. Wallace has been a hard-working grinding type of play for Johnstown, who also has been able to chip in offensively. Wallace has played three season in the NAHL, two for Johnstown and one for Fresno. In 165 games he's scored 18 goals, 41 assists, good for 59 points, 91 penalty minutes, and is a plus 16. Wallace handles the puck well and never gives up on a play. Watt has played two seasons in Johnstown. Before the team relocated to the city he for the Alaska Avalanche, the team that became the Tomahawks. He is only six points behind last year's total of 37. That's pretty impressive considering last season he played most of the year on the top line with Gylling and Kontny, both of whom are not on this years team. Having new linemates and not on the top line, Watt has still been able to score 31 points. His biggest highlights on the season were his back-to-back hattrick nights vs. the Michigan and Wenatchee. Total Watt has played in 154 NAHL games, scoring 49 goals, 41 assists, good for 90 points, 60 penalty minutes, and is a minus 2. Another player that will be missed next season. Reinholz goes down in the Tomahawks' history books as the first player to drop the gloves at Home since the team moved to town. It didn't take him long as he did this feat vs. the Michigan Warriors in the team's first home game. Not only has Reinholz been a physical presence on the team but he's been able to be a leader in scoring and has been a team captain. Our biggest knock on him last season was him not being able to control his temper at times on the ice, which caused him to be ejected a total of five times. This season, Reinholz has fixed that part of his game and has yet to be ejected this season. 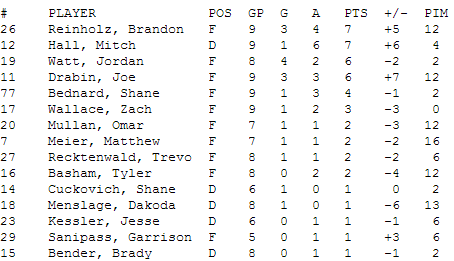 Reinholz's only time in the NAHL has been his two full seasons with the Tomahawks. In a total of 107 games he has scored, 35 goals, 31 assists, good for 66 points, has 218 penalty minutes, and is a minus 1 overall with the Tomahawks. He was also able to play with childhood friend, Mitch Hall the last two season with the Tomahawks. Reinholz is yet another player that will be missed in a Johnstown uniform. We're of course rooting for Johnstown, but we're also rooting this weekend for Michigan and Topeka. Sure, we're still in the regular season but because of the tight race to the finish these last few games are very much like playoff games for the Johnstown Tomahawks. This weekend the Tomahawks head to Springfield to take on the Jr Blues. This is the last time the two teams will play each other this season. This season Johnstown is 4-2 vs. Springfield. The two losses came at Springfield. Springfield comes into the weekend with a record of 22-24-7 which is good for 51 points and last place in the North Division. Though the Jr. Blues are in last place they are only four points back from fourth, and the last playoff spot. Johnstown comes into the weekend in 3rd place with a record of 26-23-4, which is good for 56 points. Johnstown is only two points away from dropping out of a playoff spot. So as you can this weekend has a lot on the line, as does the rest of the 2013-2014 season. Johnstown needs to win these important games and during the weekend review for last weekend we talked about the things we feel the team needs to do, and to do better to get back on the winning track. Johnstown is 0-4-1 in their last five games. Springfield is 2-3-0. This weekend we're rooting for Port Huron and Michigan to win their games to give Johnstown some breathing room in the standings from Janesville and Soo, both of whom the Tomahawks still play this season. Last weekend we held a contest to give away two free tickets. At the end of that contest nobody had won so we're holding another contest, and this time we'll be giving away a total of four tickets. Here's the rules and how you play. 1. Head over to our Twitter or Facebook page. 2. Tell us who you think we'll score first for the Tomahawks on Friday Night. 3. Tell us during what period and what time that player will score. 4. Deadline to make your guess will be 7pm est. Two Free tickets on up for Grabs. Then on Saturday night we'll hold the same contest and ask who you think we'll score the Tomahawks first goal on Saturday night. That deadline will also be 7pm. The person that guesses the correct player wins! You can guess as many times as you'd like, but only once with the same player. The reason we ask you for the period and time, it'll be used as a tie breaker if several people guess the right player. First we'll go by period and then by time of goal. The person closest to the correct time without going over wins. At the end of Friday night's game, you can then begin to make your predictions for Saturday night's game. If nobody wins we will randomly select two winners from each night to win the tickets. So please start making your predictions now for Friday night's game, and tell your friends also to play, as this will be the last chance to see the Tomahawks at home this regular season.